You can substitute scampi with large prawns. Cut the fennel and onion into julienne (thin slices) and add to the mixing bowl with the balsamic vinegar and oil, toss in. Cut bell pepper into small cubes, add to the bowl. Remove the rind on the orange then cut into segments and add to the mixing bowl (save all orange juices and add it to the salad); gently toss in the bowl with all ingredients. Reserve at room temperature. Clean scampi, leave tails on if desired. In a bowl mix together olive oil, citrus juices, garlic, chopped coriander and orange zest. Add scampi and leave to marinate for 30 minutes to 1-2 hours. Heat the frying pan on a medium-high heat, add scampi without marinade. Cook for 2-4 minutes on each side, depends on the size of scampi. Season to taste. Season the salad and gently mix. Divide the salad evenly on plates. Serve salad with scampi placed on top. Sprinkle with finely chopped coriander and drizzle even more oil, if desired. Sharing at 62nd FF party with Angie, co-hosts Jess, Prudy and all guests! Hope you all gonna love these bright, healthy and delicious dish! 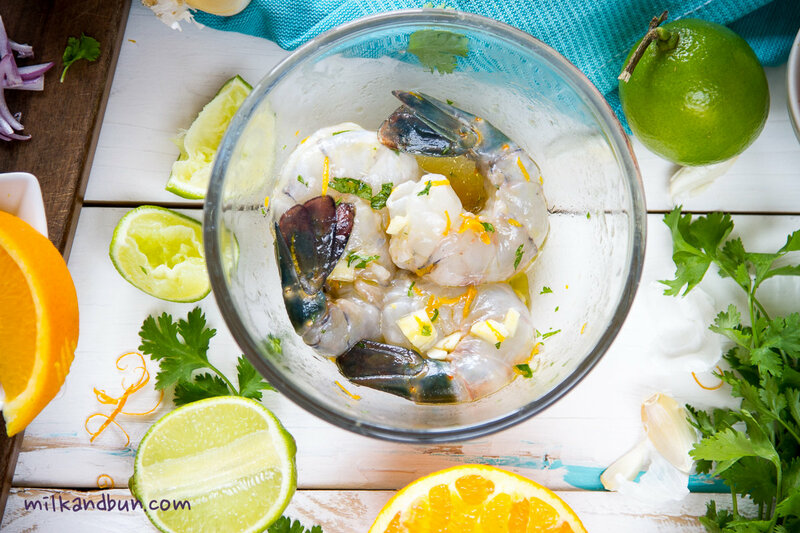 Apr4April 4, 2015 • By milkandbun • This entry was posted in Appetizer, Festive Cooking, Fish and Seafood, Healthy choice and tagged appetizer, citrus, citrus marinade for scampi, cooking, extra virgin olive oil, fennel, fennel orange salad, fennel salad, fine dining at home, food, food photo, food photography, food styling, fried scampi recipe, healthy, healthy cooking, lime, low-carb recipe, orange juice, photo, photography, recipe, romantic dinner, romantic recipe, scampi, scampi recipe, scampi shrimps, seafood, shrimps, starter, Whole30, Whole30 recipe. Bookmark the permalink. Looks delicious, such a colourful dish. What a wonderful combination of flavors…the scampi had to be delicious. Gorgeous photos and amazing recipe. I love citrus and shrimp. So summery and wonderful. I love this recipe! Yum, seafood and citrus is wonderful. This looks so refreshing! 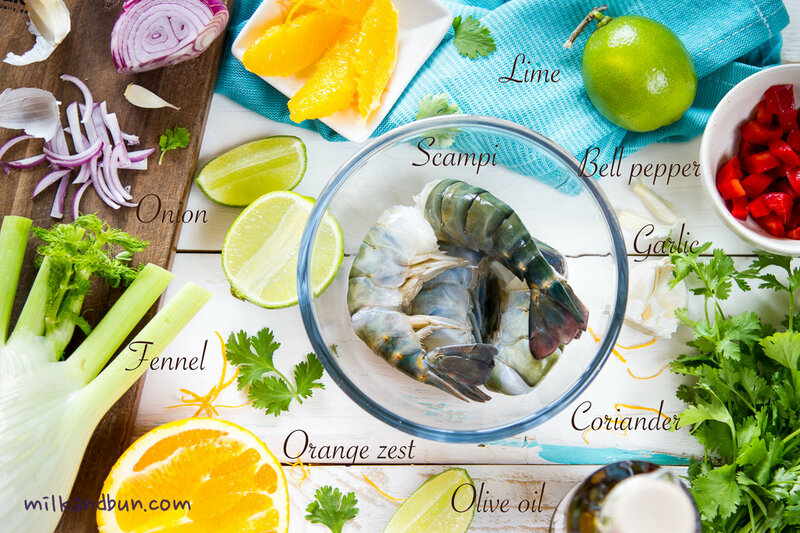 Lovely way to let the flavors of the scampi shine! So fresh!! It turned out an amazing combination! 🙂 Hope you will give it a try! Sounds refreshing, perfect for the warmer weather, which is slowly getting here but I have faith! Those scampi look beautiful! I’ve never cooked scampi as usually use prawns – but this is a great recipe and probably would work well with many types of fish. Thanks for sharing! It was so delicious that I couldn’t stop eating it! 😀 Have a nice week, too Jhuls! Mika. You have good food recipes and beautiful pictures. 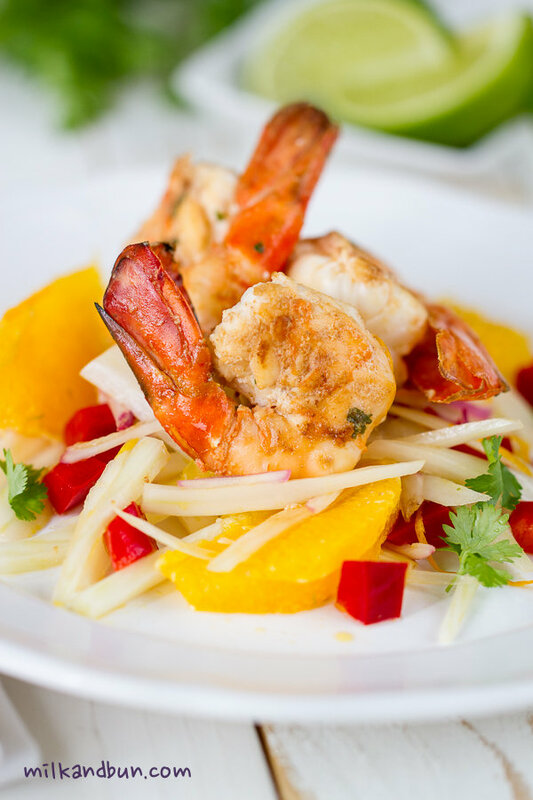 I like your Citrusy scampi with fennel salad, with mouth watering pictures. This shrimp is popular in Vietnam. Since shrimps are fresh, so you can grill or boil them. If boil it, use just little bit of water only. Do not over cook it. The grilled shrimps are tasty and juicy. We make simple dipping sauce for seafood with little bit of salt, fresh ground pepper, and lime. If you watch Food Network (American cooking channel), shrimp head is the best part for the chefs. Use shells and heads for seafood stock. Looks like such a refreshing salad! Beautiful! I love this kind of salad. I made shrimp salad a few weeks ago (and posted on my blog). it was easy and light. NOW I love to try yours soon!